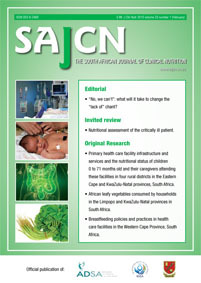 Primary health care facility infrastructure and services and the nutritional status of children 0-71-months-old and their caregivers attending these facilities in four rural districts in the Eastern Cape and KwaZulu-Natal provinces, South Africa. Objective: To assess primary health care (PHC) facility infrastructure and services, and the nutritional status of 0-71-month-old children and their caregivers attending these facilities in the Eastern Cape (EC) and KwaZulu Natal (KZN) provinces, South Africa. Design: Cross-sectional survey. Setting: Rural districts in the EC (OR Tambo and Alfred Nzo) and KZN (Umkhanyakude and Zululand). Subjects: PHC facilities and nurses (EC 20; KZN 20); children 0-71-months-old and their caregivers (EC 994; KZN 992). Methods: Structured questionnaires and anthropometric survey. Results: Of the 40 PHC facilities 14 were built or renovated after 1994. PHC facility access to basic resources was as follows; safe drinking water (EC 20%; KZN 25%), electricity (EC 45%; KZN 85%); flush toilets (EC 40%; KZN 75%) and operational telephones (EC 20%; KZN 5%). More than 50% of the nurses reported problems with basic resources and the existence of cultural practices as influencing the quality of services. Home deliveries were common (EC 41%; KZN 25%). Social grants were reported as a main source of income (EC 33%; KZN 28%). A few households reportedly had enough food at all times (EC 15%; KZN 7%). The prevalence of diarrhea as reported was high (EC 34; KZN 38%) and it was the leading cause of reported under-five deaths. Stunting in children 6-60 months (EC 23%; KZN 24%), and overweight/obesity in adults (EC 49%; KZN 42%) co-existed. Conclusion: Problems regarding infrastructure, basic resources and services adversely affect service delivery and the well-being of rural people and need attention.